Easy to swallow! Eye sight. Free from gluten, lactose, nuts and wheat. 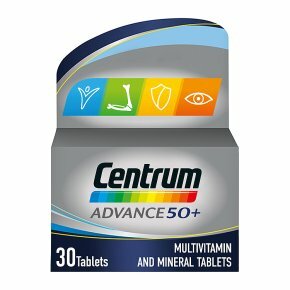 Complete daily multivitamin for the general wellbeing of adults over 50 Why choose Centrum Advance50+? From the World's No. 1 Multivitamin? More than 35 years of nutritional science expertise Tested to high quality standards Improved easy to swallow tablet Complete from A to Zinc* for the general wellbeing of adults over 50 Free from gluten, lactose, nuts and wheat ?Based on worldwide sales of the Centrum range Vitality - Vitamin B12 & thiamine help unlock energy from your diet. Bone Strength - Include calcium, vitamin D and vitamin K to maintain strong bones. Immunity Support - Vitamin C is important for the normal function of your immune system. Eye Sight - Vitamin A and riboflavin support your eyesight. Directions for Use: Take one tablet daily with water, preferably with food. Do not exceed the recommended daily dose. A healthy lifestyle and varied and balanced diet are important. This product should not be used as a substitute for a varied diet and healthy lifestyle.<br>If taking other supplements, please read the labels as they may contain the same ingredients.<br>Suitable for adults and children over 50. This product is not suitable for pregnant or breastfeeding women.<br>Product contains iron which can be harmful to children if taken in large doses.<br>The container inside this pack is sealed for your safety. Do not use if the foil is broken.<br><br>Store out of sight and reach of young children.